Supplì are the most typical Roman street food. Similar to, but different from, Sicilian arancini, they are egg shaped balls of rice deep-fried in breadcrumbs. There are various flavours, but the most typical one is with meat ragù with pecorino romano cheese. They sometimes come with a mozzarella centre known as supplì al telefono (telephone supplì) as the stringy mozzarella is like the wires of an old-style telephone. Supplì waiting to be fried just for you. Food Box’s supplì come in three different varieties: classic, vegetarian, and cacio e pepe (cheese and black pepper). Unlike most shops in Rome, their supplì are cooked to order rather than being cooked first and left under heat lamps. This means that the breadcrumb coating is super crispy, but that you have to wait a few minutes before biting into them. The depth of flavour is fabulous making them, for me, among the best supplì in the Eternal City. These artichokes were first (and still are) made in Rome’s Jewish ghetto, one of the most historic areas in the city centre. The artichokes are cleaned and the outer leaves removed, and then they are flattened, traditionally by beating two of them together, marinated in lemon juice, seasoned, and deep fried. You eat them leaf by crunchy leaf. Again, Food Box cook theirs to order for a really fresh experience. 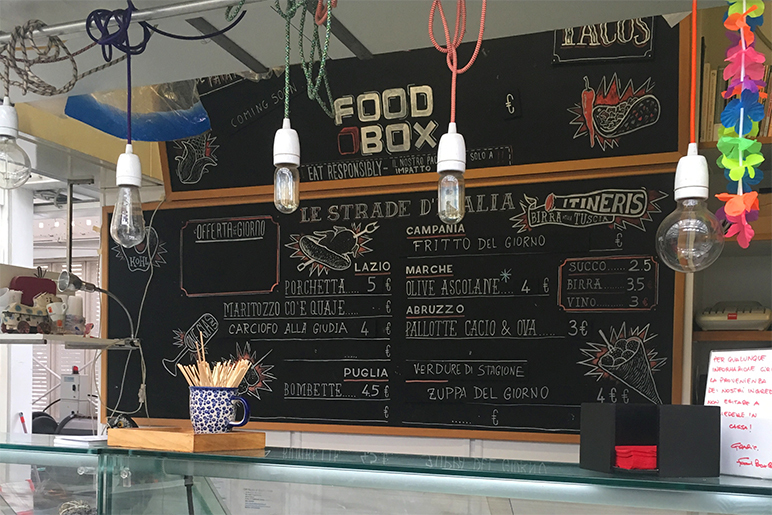 If you are in the Testaccio area at lunch time, Food Box is to be tried for a real Roman street food experience. All the offerings are hand made with top quality ingredients. The prices are not the cheapest in Rome but by no means expensive and you really are paying for a premium product. Food Box: small but delicious. Food Box is not a restaurant but a street food stall. They have one small table and a few chairs to sit on, or you can eat standing at the bar or walking round the market, all of which are pleasant experiences. Highly recommended. Food Box, Mercato di Testaccio, via Lorenzo Ghiberti, 00153 Roma, Lazio, Italy. Open Monday-Saturday 10.30-15.30. Street food served standing at the bar. Prices range from €3–5 for individual items. Thanks so much for this – can’t wait to check this out. I can’t get over how crunchy the supplì are. Every time I read one of your posts, I am overcome with travel lust. I believe I am traveling to Greece in March, but Italy is definitely my next International trip after that, so I’m going to be saving up all of your restaurant reviews for Rome. Those artichokes were a most tasty surprise. There are one of the best things imaginable! Supplì are just one of the best things about Rome, right? The carciofo season is just starting now and will last all winter. How many can I eat? YUM! Suppli, pizza con fiori di zucca Caravaggio and the Pantheon-my fav things in Roma!